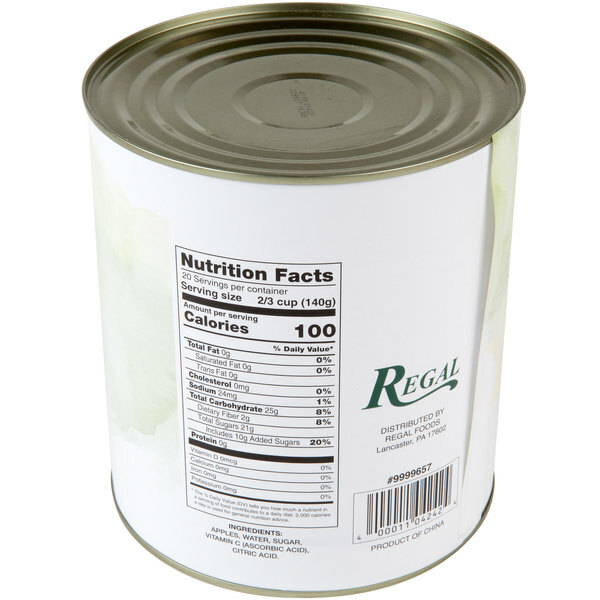 Easily add a delicious treat to your menu with Regal Foods #10 can sweetened applesauce. 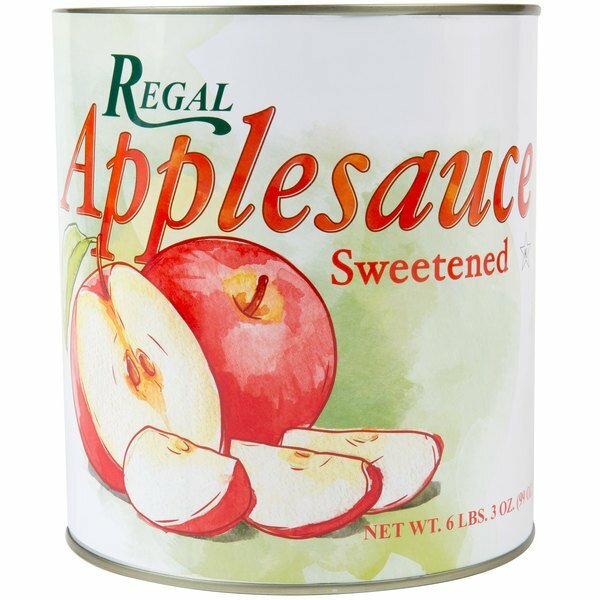 Offering patrons a familiar flavor, perfectly smooth texture, and a touch of added sweetness, this canned applesauce delivers fresh-from-the-orchard taste with a homemade feel. Pour it over roasted meats for a sweet autumnal flavor, or use it as a glaze for grilled foods. The possibilities are endless! It is packaged in a generously-sized can for easy preparation and great service. "Yum! this applesauce is delicious! 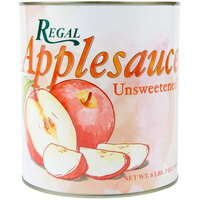 I bought this for my large family, and believe it or not, its all gone Really good quality and great taste"
This sweetened applesauce is a wholesome treat that also offers a myriad of uses in your commercial kitchen. In fact, applesauce lightens the caloric density of your recipes when used in place of margarine, butter, shortening, or oil, but still provides a tender, crumbly texture and a slightly sweeter flavor. Sweetened applesauce gets its start from perfect apples. When growers deem the climate and soil acceptable for growing apples, they plant, prune and water the trees to ensure successful growth and an ample harvest in the years to come. After growing and harvesting, the apples are crushed into the rich pulpy sauce your customers have come to love. 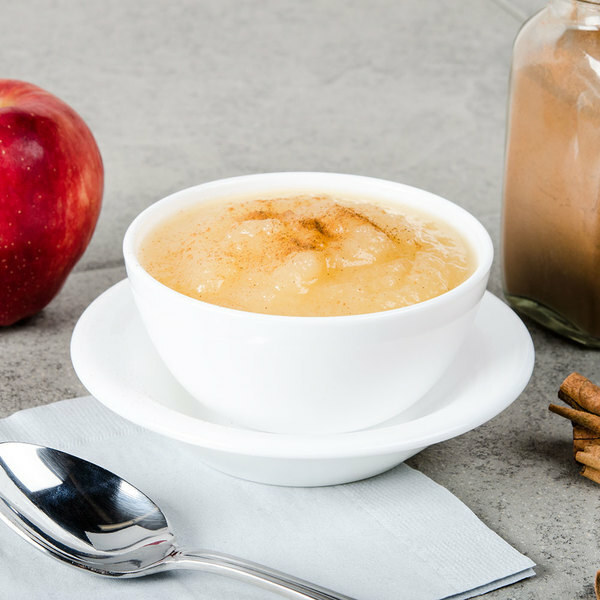 Like the fresh, tree-ripened apples it's made of, this applesauce is naturally high in nutrients and contains no fat or cholesterol. Use it as a healthy snack or side for guests who still wants something sweet with their meal. Absolutely delicious. It is very cheap so I had low expectations, but it turned out to be very good. I am a big lover of apple sauce, so you can trust me when I say this tastes good. I simply added a bit of cinnamon - just because I like - and it was perfect. I will be buying this again. This is a huge can of apple sauce and the price!!!! You cant beat that! My son had his wisdom teeth out and can only eat soft foods. This will last for sure. 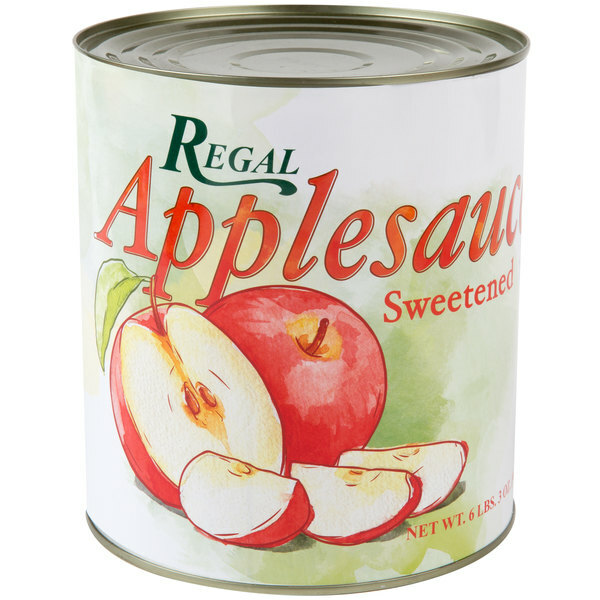 The Regal Foods sweetened apple sauce is delicious and makes a great salad bar item. The sauce is very good in texture and tastes great. This apple sauce has a nice smooth texture while still being nice and thick. Not too runny or watery. It has a lot of flavor, and its a nice sized can so it is a great side or dessert for the family. Also the price compared to other brands and other stores is cheap. 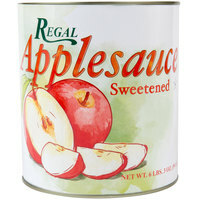 A great size can of sweetened apple sauce that makes a great dessert for our kids. Love the taste and texture and the price is awesome. lovely applesauce, at a very good price!!! i prefer the sweetened apple sauce, as i can then easily mix in some ground cinnamon (to taste) when i'd like a cinnamon applesauce. This, well, tastes like sweetened generic applesauce. It is decent. 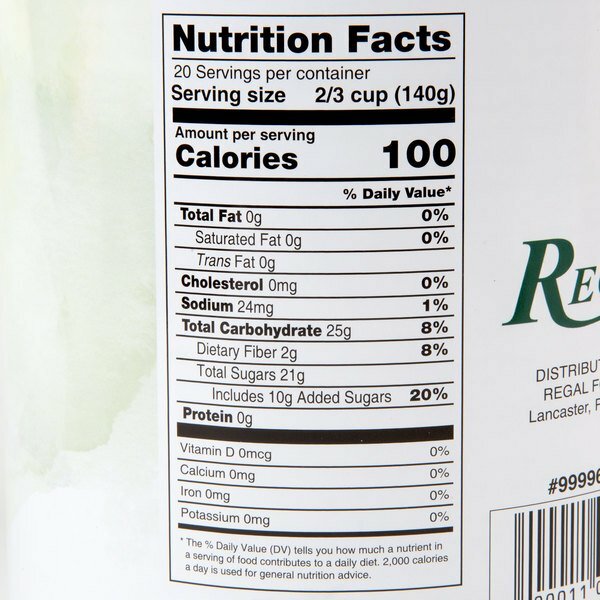 It is good for using to replace the oil, or some of it, in baking recipes. This Apple Sauce is typical mass produced apple sauce. It is quite sweet and thin, but for the price is it an economical option for apple sauce. This apple sauce tastes amazing, it is sweet but not too sweet and makes for a great topping on apple pies and other baked goods. when it comes to side dishes apple sauce is an easy way to go. after all who doesn't like apple sauce. when go through a lot of it and everyone loves it. 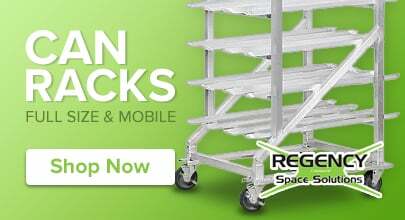 great item and ships fast. This product is great for use in baking sweets! It is mighty sweet but the quality is good and the product is great on pork chops in particular!